Dermatologists agree that sun exposure is one of the biggest triggers for rosacea progression and recommend that all rosacea sufferers wear daily sunblock for protection. Cause extensive damage to the outer layer of facial skin. Destroy the collagen and elastin in our connective tissue. Stimulate the growth of new blood vessels. Cause the release of potent dilators from rosacea-affected skin cells. The negative affects of sun exposure on rosacea skin cannot be overemphasized and all rosacea sufferers should be proactive in protecting skin from damaging UV rays with daily application of sunblock. Rosacea specialists have demonstrated that the outer layer of rosacea skin, which forms a protective barrier from environmental insults, is physically abnormal, extremely thin and no longer acts as a protective barrier for most rosacea sufferers. This abnormality, combined with blood vessels that dilate easily and often, leads to hyper-sensitive skin that reacts intensely to sun exposure. Therefore, one key to rosacea treatment is to find a protective barrier cream. Three substances have been shown in rosacea clinical studies to exert excellent skin protective actions — micronized zinc oxide, dimethicone and cyclomethicone. Well tolerated on rosacea skin. Skin protectants such as zinc oxide, dimethicone and cyclomethicone are usually non-irritating and non-sensitizing to rosacea skin. Decreases heat build-up on the facial skin from UV sun rays. Because zinc oxide reflects sunlight from the facial skin, it decreases sun-induced heat build up on the skin — this is very important to rosacea skin as heating the skin often triggers flushing. Decreases physical damage to facial skin. Zinc oxide, dimethicone and cyclomethicone protect the skin from UV-induced free radicals that damage facial blood vessels and skin cells. Adds an invisible barrier to the outer layer of facial skin. These important skin protectants enhance the outer epidermal layer which increases the skin’s overall protective ability. Helps reduce facial redness. All three ingredients have soothing and anti-inflammatory actions which often reduce facial redness. 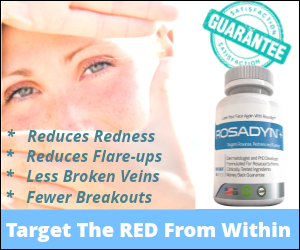 Helps heal damaged/abnormally thin rosacea skin. Topical zinc oxide has significant skin healing and thickening actions. Many sunblocks and moisturizing day creams now use microfine zinc oxide, dimethicone and cylomethicone as their primary active ingredients. Thus, quality skin care companies are now making three-in-one products that are ideal for rosacea skin because they act as a sunblock, skin protectant and anti-redness product. It is important to emphasize that advancements in microfine zinc oxide technology now result in a topical zinc oxide that is invisible to the naked eye, elegant, non-greasy, and enhances the healing actions of topical zinc oxide as the smaller particles can incorporate themselves more effectively into the outer skin barrier. Zinc oxide concentrations in these combination sunblock/skin protectant products range from 2% to 14% with the ideal concentrations falling in the 5% to 8% range. This product contains Silybum Marianum extract which has been proven in clinical studies to reduce rosacea redness and superficial skin inflammation. 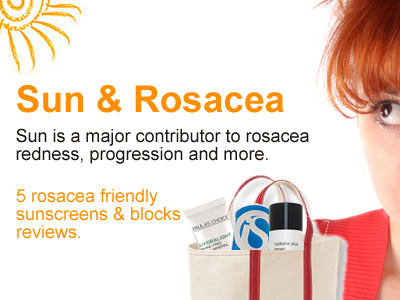 What Rosacea Sunblock do you like the Best and Why?